SOHC. 3 Dell' Orto Carbs. Elect start. In the mid seventies there where many superbikes availiable, ranging from vast 1200cc twins to smaller multi cylinder machines. and if more performance and superbike are synonomous it seems that the Benelli is at the bottom of the list. both as an expensive piece of two wheeled confection and as a smooth and relaxing tourer. Multi plate clutch running in an oil bath. Five speed box and left foot gear changing. Chain drive to rear wheel. 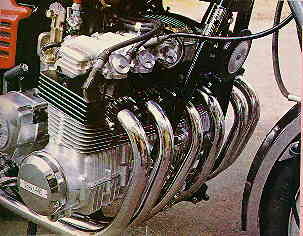 The heart of the machine is the Moto Guzzi manufactured SOHC 747.7cc six cylinder engine. 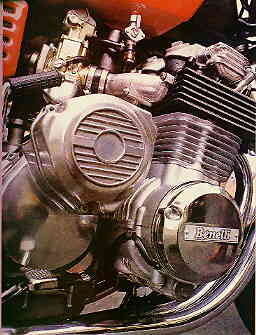 Fed by three Dell' Orto carburettors. This unit which is mounted accross the frame produces 71bhp @ 8900rpm and pushes the 485lb machine to 113mph. Performance at the top end of the speed scale is probably hampered by the vast frontal area whish presents a sizeable unaerodynamic mass to penetrate the wind. However the Sei makes light work of shifting its weight away from standstill with the engine sounding not unlike its Latin supercar cousins. Handling and cornering are exemplary, although the rider may feel perched on the bike as opposed to being united with it due to the high handlebars and consequent upright riding position. In-town manoeuvring is surprisingly not the headache it may seem. The engine is not prone to fouling and the cycle can be eased thriugh traffic quite easily, helped or course by the upright riding position. One must remember the width however. The brakes have to be powerful and indeed they are. The twin front disc and large rear drum hauling the Benelli down from high speed easily and with little fade. it might be an idea however, to take up the BMW idea of cross-drilled discs at the front, just to get over the problem of uncertainty of braking in the wet. Twin discs to front and drum rear. Front telescopic forks with coil sping dampers. Italian machines have, in the past been criticised for their archaic instruments and switch gear but the 750 Bennelli goes someway to alleviating this. They are legible and easy to use. Underlining the fact that this is a touring motorcycle, the fuel tank holds no less than f gallons, giving a cruising range of up to 250 miles. The efficent and lightly stressed is quite frugal, getting more than 50mpg at times. 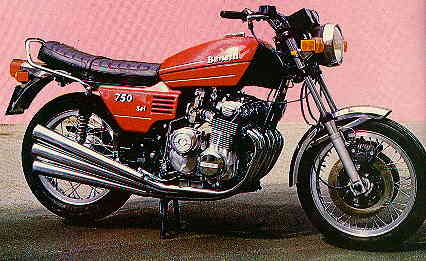 So, is the Benneli 750Sei a practial motorcycle or, as many have said, an expensive piece of technological sculpture? There is no doubt that the engine, with its perfect secondary balance is efficient, as demonstrated by its power output and economy. It handles well and corners quickly, in fact the only thing lacking is the top speed and extra bite of acceleration. If that worries you though, you could go to the main Belgian importer who wil supply you with an overboard 900cc bike, or you could wait for the factory to bring out thier much awaited twin OHC version. Then you will have a superbike in every sence of the word.